Google is on march to make sure to continue monetizing searches in any way possible. 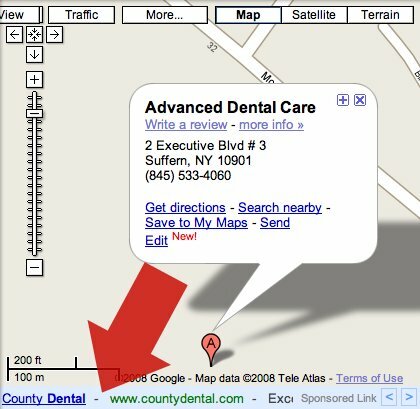 This time, Google has added AdSense to Google Maps, in some cases. This was reported at Search Engine Land, Digital Inspiration and Bloggle first. Let me take you through it. The ad shows a relevant dental ad. But sometimes you do not need a business address, sometimes an ad for office space might come up. It has in my case. This seems to be a test right now, so we will see how long this lasts. Google has been testing and posting local ads for a while now. For more on local business ads at Google, see here.